Song Samples in mp3 format Listen! Enrich your children’s experience in the New Testament with Stories of Jesus. 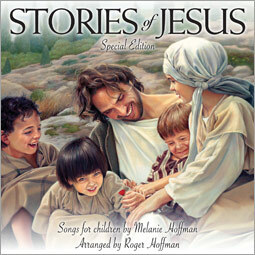 15 carefully researched stories about the life and miracles of Jesus, including Gethsemane, are unfolded in Melanie Hoffman’s joyful songs. I just love the Stories of Jesus music!Such sweet truth set to beautiful tender music! I have one daughter who loves to practice singing with the wordless tracks while we're driving. I get to drive around town with a sweet little concert everywhere I go! Thank you so much for your beautiful music! My family loves the entire CD. I purchased all the songs shortly after buying Gethsemane, ad I've even purchased the entire set of sheet music. My 17-year old daughter and 12-year old son have had a great time learning the songs on their stringed instruments (they play the cello and violin). It's also been so much fun to teach my 7 and 5 year old sons the scripture stories that connect with the songs on the CD. They are beginning to truly love the stories of Jesus found in the New Testament. We LOVE your Stories of Jesus CD, every song! We've sung the Gethsemane one for the Primary Presentation - the spirit is felt so strong every time we sing that one. And there was a YouTube video with your baptism song in the background that we showed at our daughter's baptism. The upbeat and catchy tunes are so fun. Did you have to make the sheep song so darn sticky?! Brain sticky! It goes round and around in our heads. And every time our littlest hears the sheep baa-ing she giggles and giggles. I love your cd "Stories of Jesus" and I have wanted to gift it to friends for a long time. I really like your song "Miracles of Jesus". I would like my students to learn this for an upcoming school program. I am an elementary teacher in a small Christian school here in South Korea. I am putting together a program for our students' parents in July, and my students & I decided to do a drama about Jesus' miracles from the book of John. I was thrilled to find your song "Miracles of Jesus" when I google searched on-line for songs about Jesus' miracles. This song is perfect to go along with our play. I'm sure that my students will enjoy singing these songs, too. Thank you for caring about serving God through children's music...I pray that these songs and our message about how Jesus' miracles showed that He IS the Christ, the Son of God, will impact all of our hearts & lives and bring glory to Him. I own a copy of 'Stories of Jesus' and truly love and appreciate your work. Our primary wants to learn "Come into the Water" for our primary program next year. I have just had a holy experience after listening to the song "Gethsemane". I hold the song and its message dearly. Afterwards, I wanted to read the story behind the song. I had heard from someone, somewhere that there was some story behind the song. Is this true? I just wanted to say how much I LOVE the Stories of Jesus CD. After buying one for my own family and adoring it (I LOVE to hear my kids singing along! ), I bought one for a couple of my sisters and recently one sister called to ask how to get another CD because she couldn't find it anywhere. So, of course I have forwarded the email about you making it available on CD again. perfect job. The music is fun and it joyfully delivers its great story! And I love Child of Grace. And Zacchaeus and He is Risen. "As parents with ten children ages 3 to 23, we have all enjoyed the music of Stories of Jesus. Our younger children in particular have listened to and even memorized the songs. Gethsemene is a song which is worth the price of the entire CD. "The music and lyrics are done so well that it is a CD our whole family enjoys listening to." "The songs are fun and original and also teach stories from Jesus's life in a very kid-understandable and sweet way...I highly recommend this to any Christian with kids." "All of my children love it, from teens down to the 4-year-old, and parents enjoy listening to it, too. It has taught the children of the glory of Jesus, His miracles, and specifics about His life and ministry." Our primary kids love all your songs. I emailed Melanie a couple of years ago to let her know that Gethsemane was our kids favorite (even though most are boys as we have 5 girls in senior primary). We’ve sung it in our ward quite a few times and it still is a favorite to this day. I purchased all the music from Stories of Jesus (they are all great). We are also learning Remember and they love that one too. I have two boys (10 and 7) and after primary they come home singing that song. Today we started learning “Come into the Water” and the kids were so enthusiastic singing it. I asked my son if he like the new song and he said, you always pick the best songs Mom. It sure isn’t me, it’s people like you who have such a wonderful talent and can write such beautiful music that brings the spirit when you sing. I still get choked up singing Gethsemane. This music is beautiful and fun and just perfect for kids to learn about their Savior. My children were asked to participate in a children's choir where thesesongs were featured. So amazing!!!! I'm grateful that these stories are a little more "a part" of them now that they've sung and listened to them so many times. Thanks to the Hoffmans! truly reaches children and brings understanding on their level. My children have asked to listen to it everyday since I bought it and I love to hear them humming the songs. It is directed toward children, but my husband and I love it too and keep it playing when it shuffles through our playlist- even when it's just the two of us! I love this CD! I have 5 children and we listen to it often, especially in the car. Besides being beautiful music, it has inspired many different conversations about the life of Jesus. Pleases adults, teens and children! Original music, not new words written to old tunes. The music is pleasant andcatchy. It doesn't have annoying music "types" such as rock or country. It is not high pitched "kids" music nor is it sung by amateur children. This a very professional CD, very high quality. All of my children love it, from teens down to the 4-year-old, and parents enjoy listening to it, too. It has taught the children of the glory of Jesus, His miracles, and specifics about His life and ministry. My 7-year-old loves that the songs are in order on the CD, starting with His birth and working chronologically up to His resurrection. About a month ago I listened to a podcast on "Stories of Jesus." I was so impressed by the short samples that I had to buy it for our family. As the title suggests, the songs are all about the life of Jesus, starting with his birth and ending with remembering Him and His life. In a way I guess this could be like Handel's Messiah for children. All the songs are so beautiful it is tough to pick a favorite. One unique song is "Gethsemane," a song about the atonement. Like the composers mention on the podcast, there really isn't a children's song about the atonement. The CD insert quotes Melanie Hoffman: "I know that as children learn who Jesus is, they will look to Him, anticipate His coming, and want to be like Him, because they will know Him and love Him." The music and lyrics are done so well that it is a CD our whole family enjoys listening to. Learning more about the Savior's life through this music has been a great testimony strengthener for all of us. I highly recommended buying this for your home or as a gift. I'm really happy with this CD. The songs are cute with a great message. They have catchy tunes and are sung nicely. (I have a thing about listening to kid voices that are annoying (nasally or sounding like baby talk.) None of that here. While the songs are sung by children, they have great voices.) Beautiful CD. My mother bought this cd for our children over a month ago, and it has been in our cd player in the family van ever since. The kids absolutely love the stories about Jesus that have been put to such fun music. I love that children sing the songs, and my children have already memorized most of the songs. Our children are newborn to age 11, and they all enjoy this cd. The physical CD is now available only at Hoffman House. It also contains accompaniment tracks for all the songs. The album download is available on iTunes. Shepherds dance and angels sing. Come that we might have joy. Sleeping in a bed of hay. Come to earth to show the way. Come that we might have joy! Chorus- Hallelujah! See the joy. All around us there is joy! Jesus has come that we might have joy. Come and see the baby small in a quiet cattle stall. Can you feel the heavens shake? All of creation’s alive with his light. The stars in the heavens are shouting tonight! Jesus is come that we might... have joy. Feel the joy! Asked Herod, “Where is the baby King? And had no plans of retiring yet. Who was this baby who had his own star? “Run, run, run wise men, I want to meet this little King. And brought their gifts to the little king; Gold, frankincense and myrrh. Run, run, run Joseph. Far away from the evil king. Run, run, run to Egypt. Take your family and run. So Joseph, Mary and their little son Went to Egypt to stay. And the soldiers hunted for Jesus, But He was far away. And wicked old Herod went crazy and died. Come, come, come Joseph. Do not fear the evil king. Come, come, home Joseph. Bring your family and come. Come, come, Joseph. Come and bring your little king. laughed and played like little kids do. Chorus- Child of Wisdom. Child of Grace. The light of heaven on His face. In the temple Jesus taught. When He was twelve He knew a lot. Child of Wisdom. Child of Grace. Cry repentance and to teach. Many listened and were baptized in the water. Jesus came to His cousin John. To baptize the Chosen Son in the water. Come into the water. Come and be baptized. Come and follow Jesus to a better life. Leave the world behind in the water. That all people need to go into the water. Come and be baptized in the water. To see the miracles of Jesus. The man by the pool sick for 38 years. The woman so crooked that she couldn’t walk. The man who couldn’t speak or hear. Because of the miracles of Jesus. Until Jesus anointed his eyes with clay. And her sickness was taken away. The world had changed because of Jesus. (Chorus) Listen to the news! He’s come to bring us good news. Hey, really good news. Good news! Good news for the good guys and the bad. Good news for the happy and the sad. Good news for the rich. That’s what He has come here for. He has brought good news! For those who are right, For those who are wrong. Good news for the grownups and for the small. He has come to bring the good news to us all! (Chorus 2x) Listen to the news! One, two, three, four, five loaves and two little fishes. I’ll pack one, two, three, four, five loaves and two little fishes. I grabbed my lunch and ran to see the famous teacher in Galilee. Everyone in the crowd agreed; We’d never seen a man like Him. Waiting to hear what He had to say. He healed the sick and taught the way. There was no one in the world like Him. Then sunset came with the evening chill. Send them home, the apostles said. They’re hungry and they don’t have bread. I had one, two, three, four, five loaves and two little fishes. and women and children there. And then He sent them to go and see. With any food to share. So I gave my one, two, three, four, five loaves and two little fishes. He blessed my one, two, three, four, five loaves and two little fishes. 5, 10, 15, twenty 1,000-2,000-3,000-four! Wow! There just kept being more and more and more! He fed us all on that grassy hill. Bread and fish till we had our fill. We had twelve baskets full to spare. What a lot of food to share! Refrain - And it came from one, two, three, four, five loaves and two little fishes. Just my one, two, three, four, five loaves and two little fishes. All it took was one, two, three, four, five loaves and two little fishes. Jesus and my one, two, three, four, five loaves and two little fishes. Shepherd, Shepherd. Jesus is the Shepherd. Sheep, Sheep. We are the sheep. Sheep, sheep, fluffy little sheep, sheep. Sheep, sheep, fluffy little sheep. Sheep, sheep, funny little sheep, sheep. Sheep, sheep, silly little sheep. It’s easy to confuse us. Sheep, sheep, clueless little sheep. Sheep, sheep, sorry little sheep. Ooh, we really need a shepherd! Sheep, sheep, funny little sheep. And there came a great wind on the sea. They were helpless as they could be. Blow, blow, the wind did blow. Trying to not drown in the sea. What could they do? They would never get through. They would die in the Galilee. Because He is the Lord of the sea. And there came a great calm on the sea. And the boat moved ahead safe and free. Jesus is Lord of the sea. Jesus is Lord of the sea. For a space in the crowd where he could have a view. And then he had a thought. Here’s what he would do. Up through the branches so he could see. So he could see Jesus passing by. From the noise in the crowd that Jesus was near. Down through the branches so he could see. And brought Jesus joyfully to his house. Zacchaeus, Zacchaeus, so he could see. Waiting for Jesus to come his way. Mary and Martha were sad. was so sick that he had died. and sent word that he was ill. He could rise again. He could rise again. His friend was four days in a tomb. He would not have died if you’d come. For Lazarus and all men. He will rise again. He will rise again. the place where Lazarus lay. from the cave inside the earth. He is risen. He is risen. Lazarus has come alive. With His power Jesus called him. He is risen. He fought to keep His promise made long ago. On the day Jesus died. The sun hid its face From the shame of that place. The people who loved Him were shadowed in grief. They watched it unfold Just as they had been told. In sorrow they cried On the day Jesus died. But Jesus had come here to do this hard thing. And on love He relied The day that He died. He is risen. He is risen. Tell it out with joyful voice. He has burst His three days prison. Let the whole wide earth rejoice. Death is conquered. Man is free. Christ has won the victory. He is risen. He is Risen. Jesus has come alive. Death is conquered as He promised. He is risen. He is risen. He is risen. Lives again our glorious King. We are free from sin’s dark prison. Let all earth and heaven sing. Death is conquered. We are free. Christ has won the victory. Remember the man who walked on the wa ter. Remember the man who talked to the sea. Who cared about children and what they can be. Chorus- Oh, Remember. He asks us to remember. Oh, Remember. Always remember Him. The one who fed thousands; Who brought us goods news. Gave us the truth and taught us to choose. The man who, in three days, rose from the dead. And kept all His promises just as He said. Oh, Remember. He asks us to remember.